The jurors at the Lyme Art Association "Annual Associate Artists Exhibition" accepted 4 of 4 of my paintings to hang in the show. 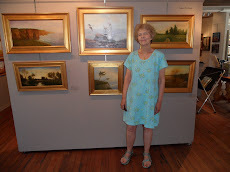 I'm very thankful to have the opportunity to have my paintings in their lovely galleries. As artists our work is constantly being judged and we have to get used to times when our work is not accepted. We may spend weeks working on a painting and then finding out it isn't going to be part of a show. Being rejected isn't always because the painting is bad; it may be because it doesn't fit with the other paintings accepted into the show. Jurors are sometimes most interested in creating a cohesive display of artworks. The two paintings in the previous post plus the two paintings below will be in Old Lyme, CT. from January 11, 2013 to February 23, 2013. Hope you can make it to the show. This painting was done at the end of last summer on the grounds of the beautiful Crane Estate in Ipswich, MA. From the lower stables of the estate there is a path that rises above the fields and marsh. If you follow the path all the way it ends at the back side of Cranes Beach. Along the way one sees beautiful vistas. One day while painting here a deer slowly walked into the scene I was painting. At times it's fun to create a landscape painting by placing paint strokes on the canvas and see what shapes appear. By recognizing the shapes as being part of natures many parts a landscape soon appears. The artist is then free to create a mood with color and form. I enjoy both methods of creating landscape paintings.